West End is home to a variety of eateries, and Gala Thai joined the throng on Boundary Street a few months ago. We received an invitation to visit, and were keen to see what the (relatively) new kid on the block had to offer. It is just a little way up from the busy part of Boundary Street, with the signage easy enough to spot from the walkway. “Gala”, it says, capital letters in black on white, and the same just beside it, this time in a handwriting font in white on black. It does also say Thai, Asian, and Beer under that in less clear lettering, partly obscured by drawings of coconuts and herbs. 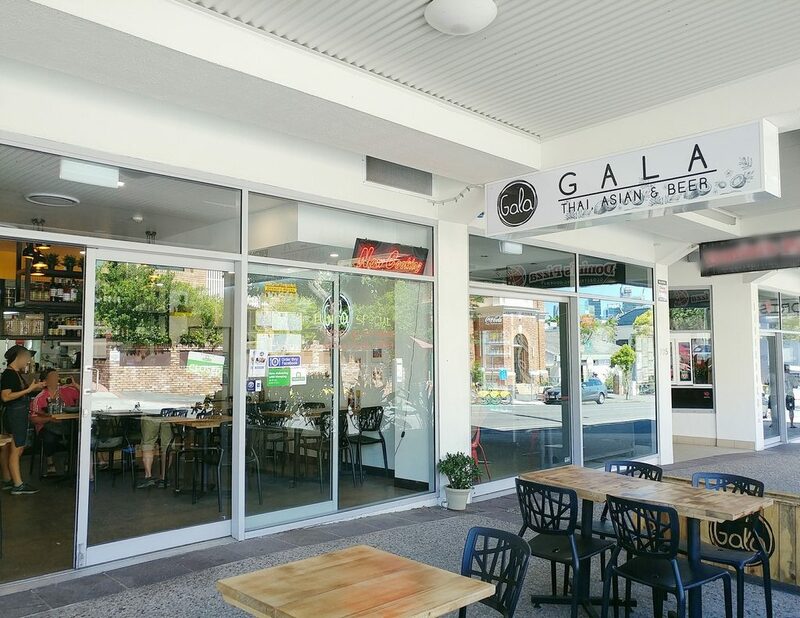 The outside area of Gala Thai. We walked through the door, and were soon greeted and invited to sit at any available table we liked. There is seating both indoors, and in the covered walkway area. We decided on a table indoors, so as to be away from street traffic. There was no fan, but a breeze came through the open door, and they turned the air conditioning on when it became a little warmer. One of the inside walls, decorated with colourful prints. The decor is simple and tasteful. One wall is a matte black, with embossed lai kranok patterns on it. 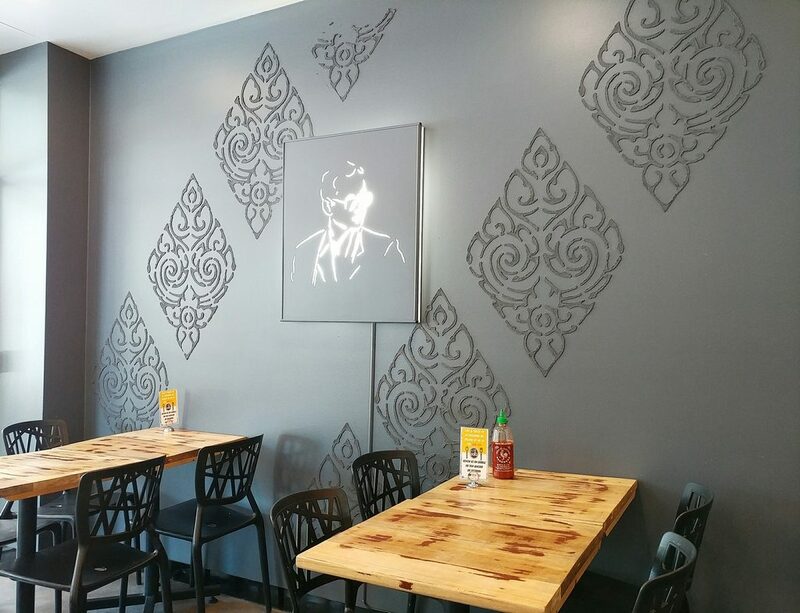 A backlit line drawing of the revered former king of Thailand is mounted on that same wall. 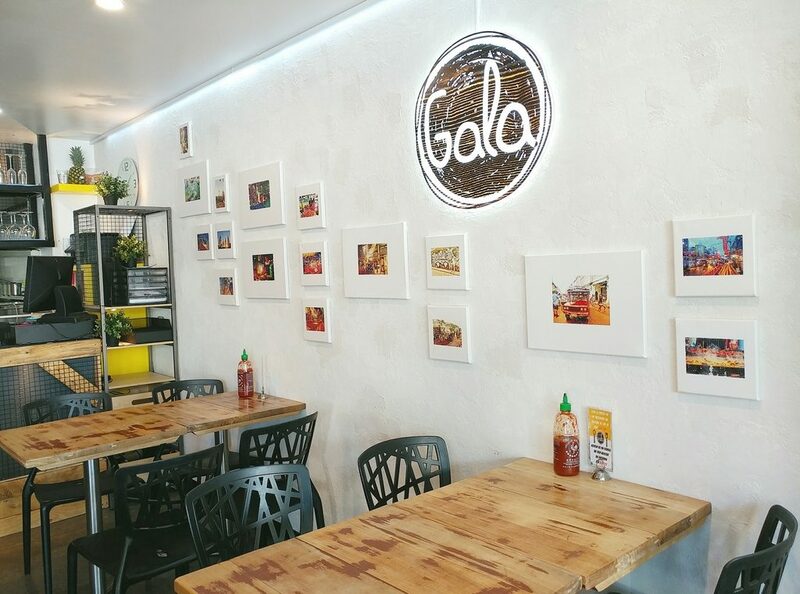 The facing wall is painted white, and has a cascade of colourful canvas prints of pictures of places that have been important to the owners. 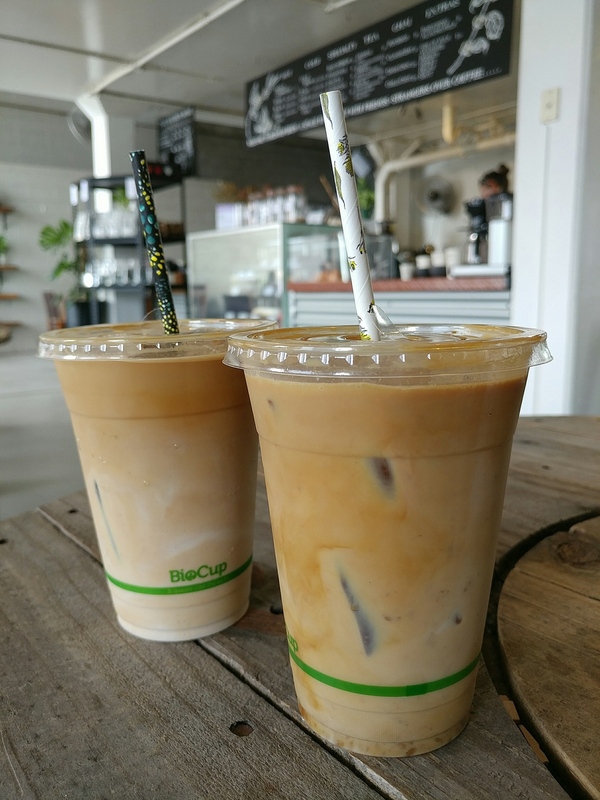 The polished concrete floors, slightly distressed wood-topped tables, and black polymer chairs with angular cutouts give the space a modern feel. The service counter, also in a similar distressed wood to the tables, separates the dining space from the kitchen, but still allows patrons a sneaky peek into the kitchen. The sounds of the spatula clanging against the wok intermittently ring out, and bright orange flames occasionally leap into view from the stove. It is a testament to their efficient exhaust fans though, that cooking smells didn’t leach out to the seating area. The service counter, and a glimpse of the kitchen beyond that. 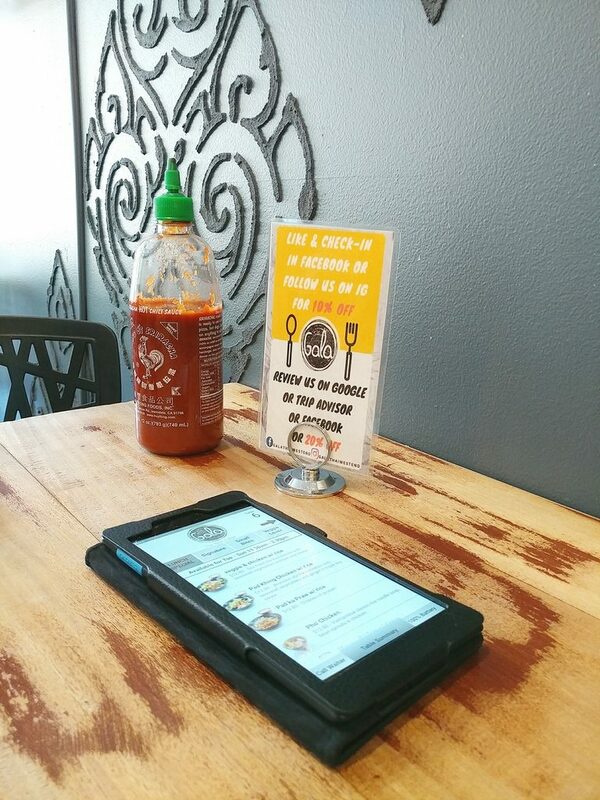 The waitstaff brought us menus, which came in the very modern form of tablets. They explained how it worked, a system quite similar to what a number of sushi restaurants, like Sushi Edo have adopted. 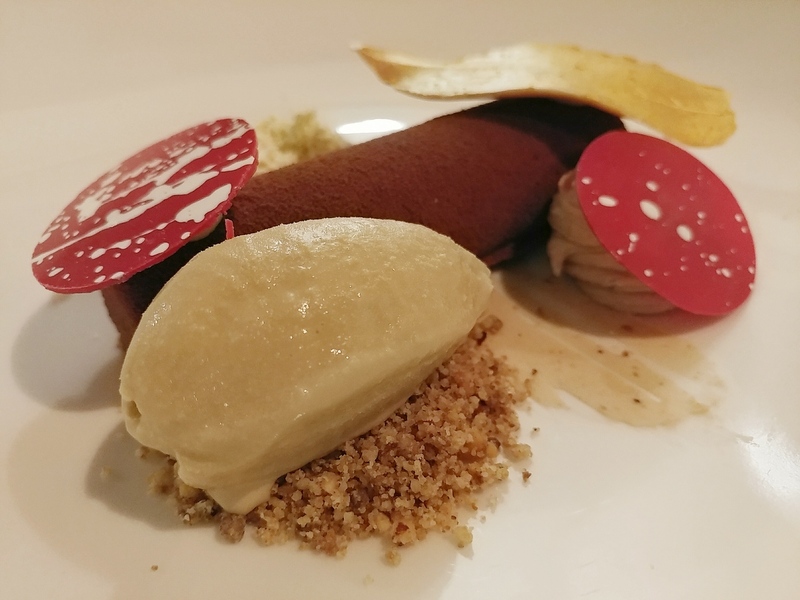 The menu was easy to navigate, with different sections like Signature Items, Small Bites, Mains, Salads, and Curries. Within each section was a list of dishes with accompanying pictures, and a description of them. 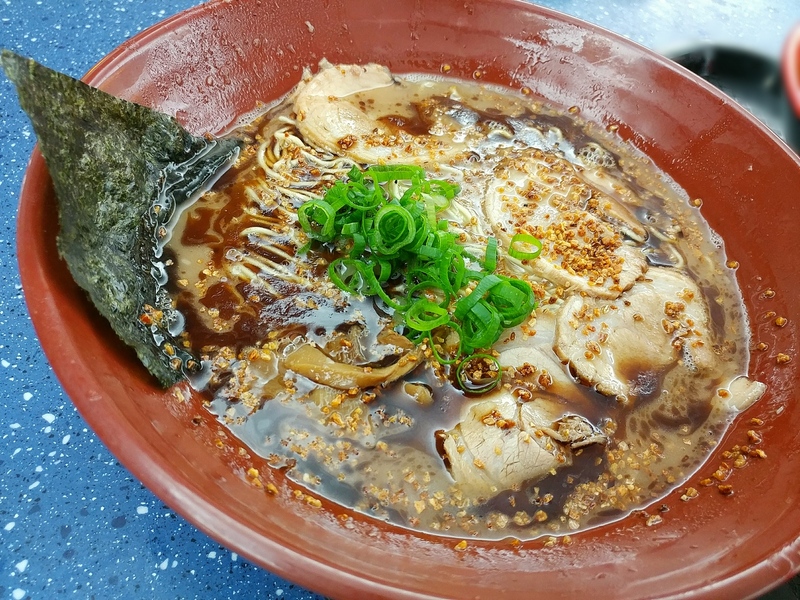 When you had decided what you wanted to order, you placed your order by clicking on the relevant button, and there was the ability to add extra requests in the comments, such as for the dish to be extra spicy, or less oily. A confirmation was then sent back that the order had been sent to the kitchen. There were many tempting dishes on the menu, and narrowing down what to have was difficult. 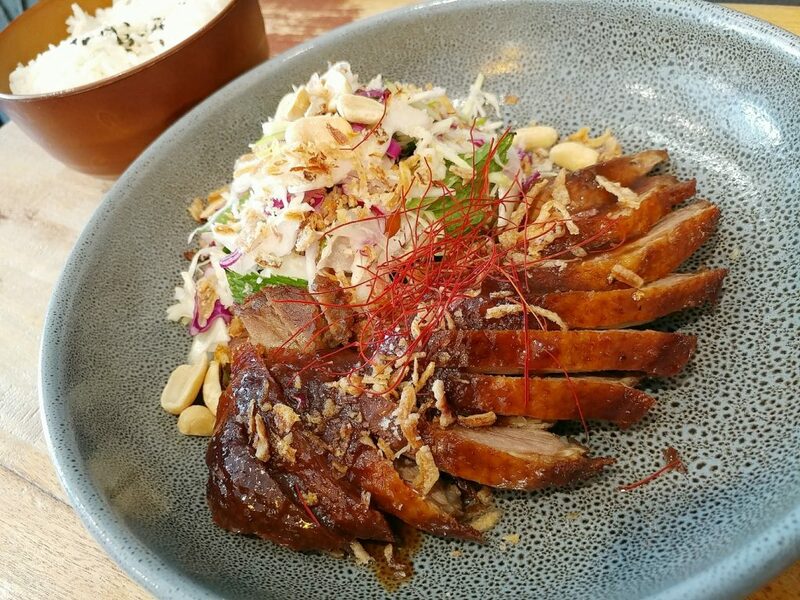 We decided to stick to dishes in the Signature section, as we thought that that would showcase what they did best, and eventually settled on the Salt and Pepper Tofu and Chicken Satay Skewers as entree items, and the Duck Tam and E-Saan Steak with Sticky Rice as mains. 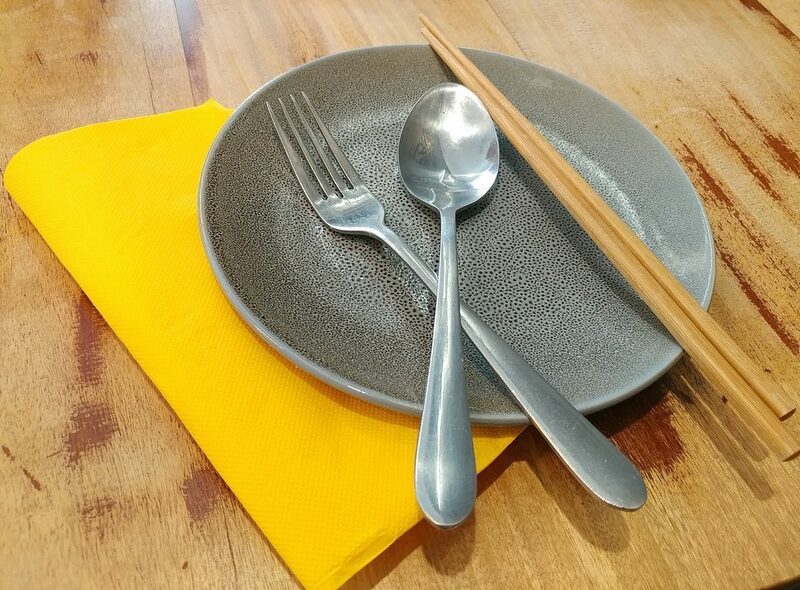 Plate and cutlery in preparation, and the sunny yellow serviette in keeping with the colour theme. 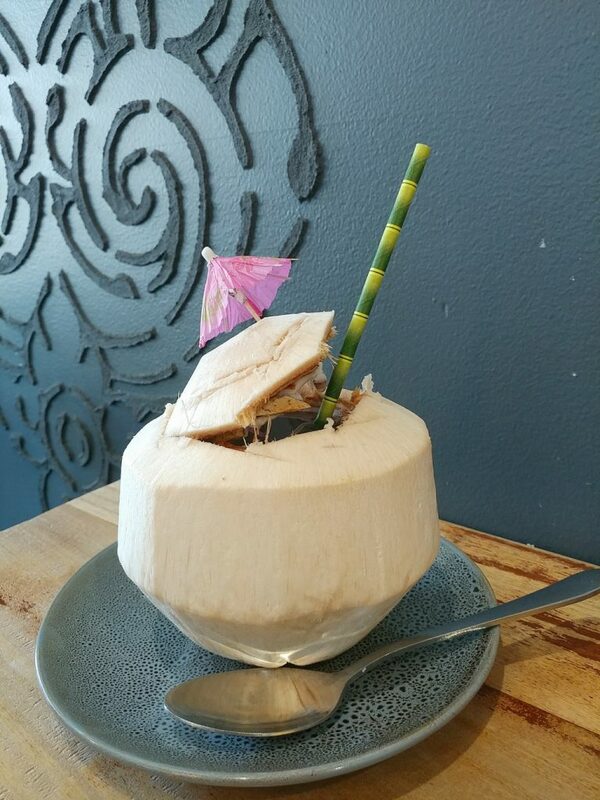 The warmish weather also made the fresh coconut juice look extra appealing on the menu, and we ordered that as well. Rather than being processed and pre-packaged, this was indeed a whole coconut. It was tropically garnished with a cocktail umbrella and a paper straw with a bamboo pattern. The coconut juice was nicely chilled, and had a fresh, natural sweetness. It also came with a spoon to dig out the coconut meat to eat afterwards. 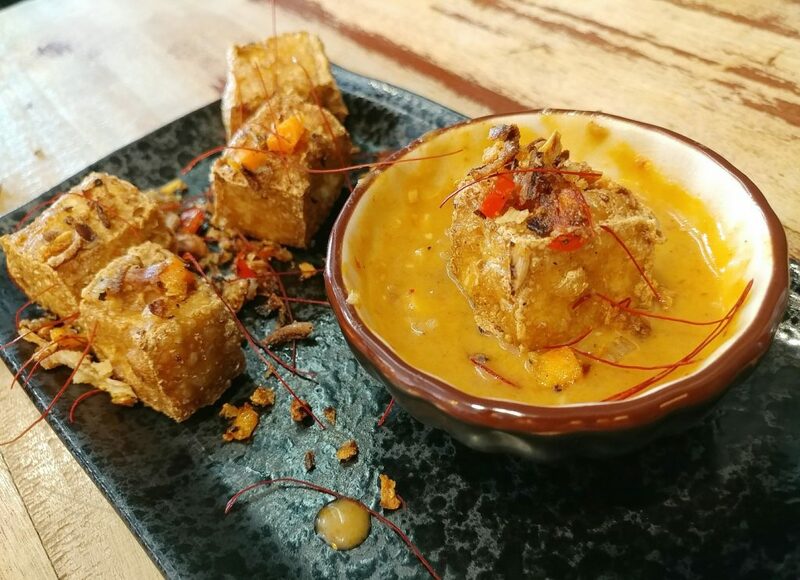 The Salt and Pepper Tofu were served as a tumble of the tofu blocks on a dish, garnished with slivers of bright red Japanese chillies, and fried garlic and spices. 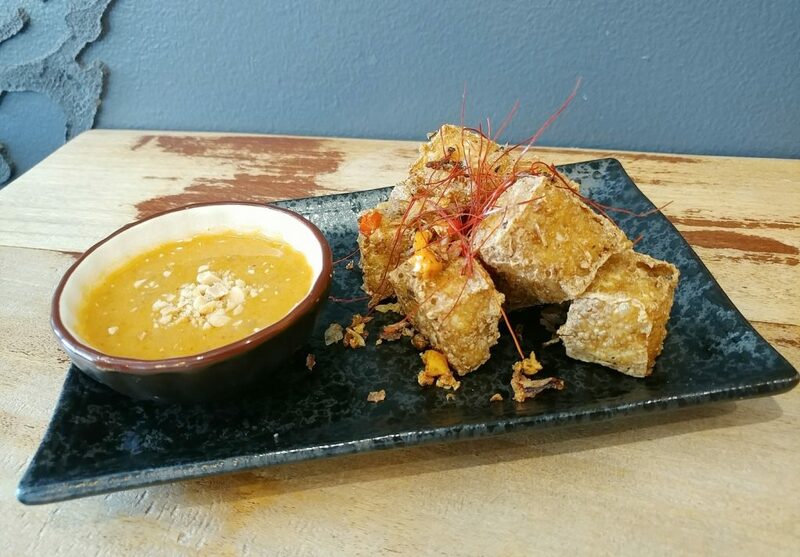 A little bowl on the same dish was filled with their signature house-made peanut sauce for dipping the tofu into. 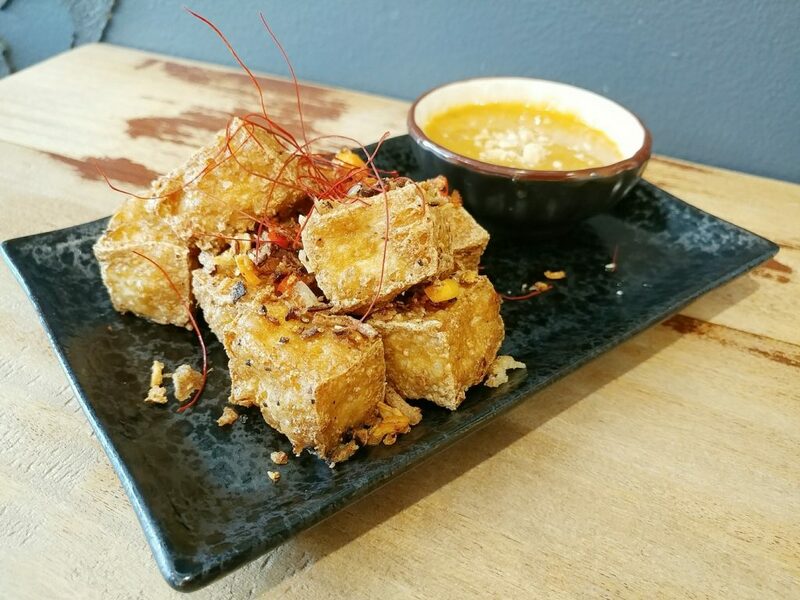 The tofu cubes were a little more than bite size, coated with a crunchy, light batter on the outside, without being oily. They had a contrasting softness on the inside, but were firm enough to hold together when bitten into. The peanut sauce was a little more sweet than savoury, and a little spicy, and was a good flavour kick. 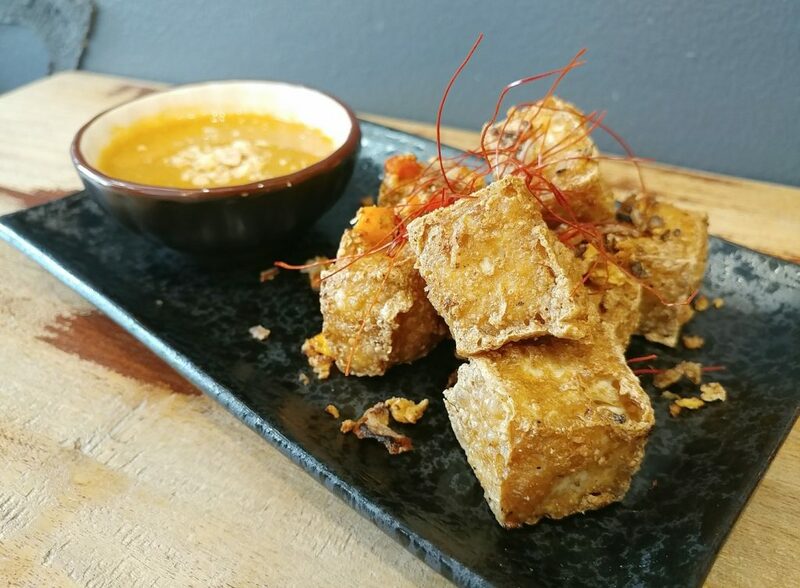 The Salt and Pepper Tofu, with peanut dipping sauce. The dish, with the sauce more in view. The fried tofu garnished and closer up. 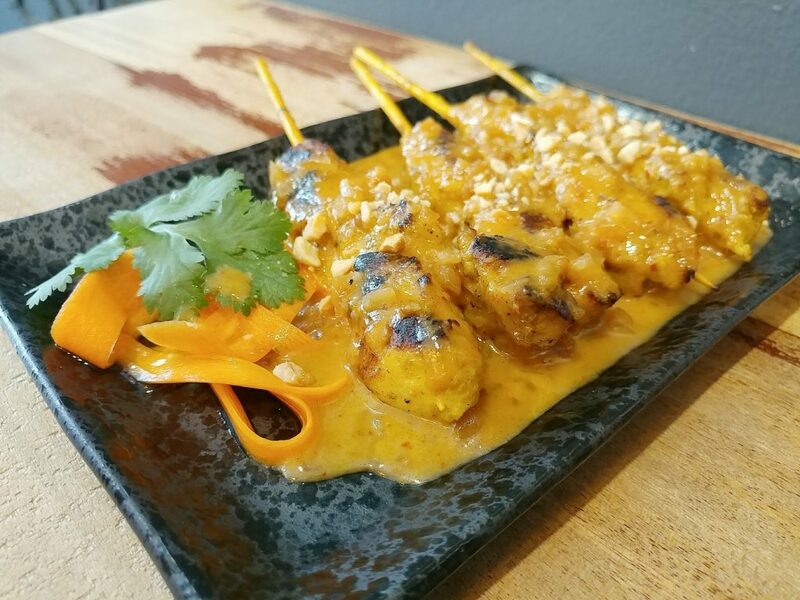 The Chicken Satay Skewers were served on a similar plate, with a house-made peanut sauce liberally poured across them, and more chopped peanuts sprinkled on top. The chicken pieces were tender, and cooked just right, so that they were still juicy, but carried a little char flavour. 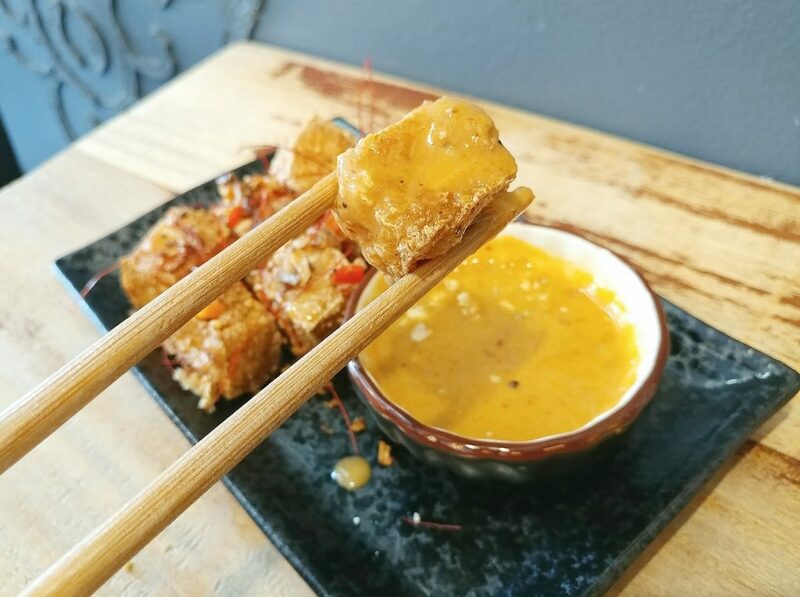 The peanut satay sauce had a different flavour from the sauce that accompanied the tofu, more savoury, and with a fish sauce note. There were also house-made pickled carrot strips on the side of the dish. These were crunchy and tangy, and were a good, fresh contrast. 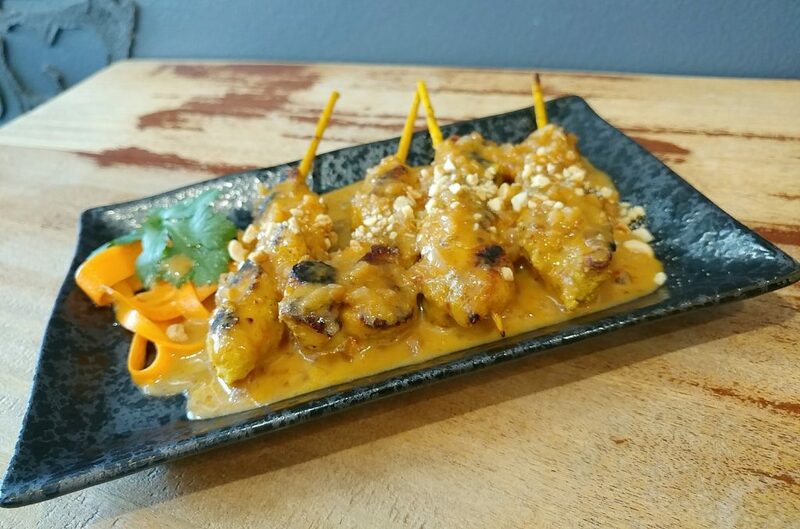 The Chicken Satay Skewers with peanut sauce. The Chicken Satay Skewers, and the pickled carrot strips. 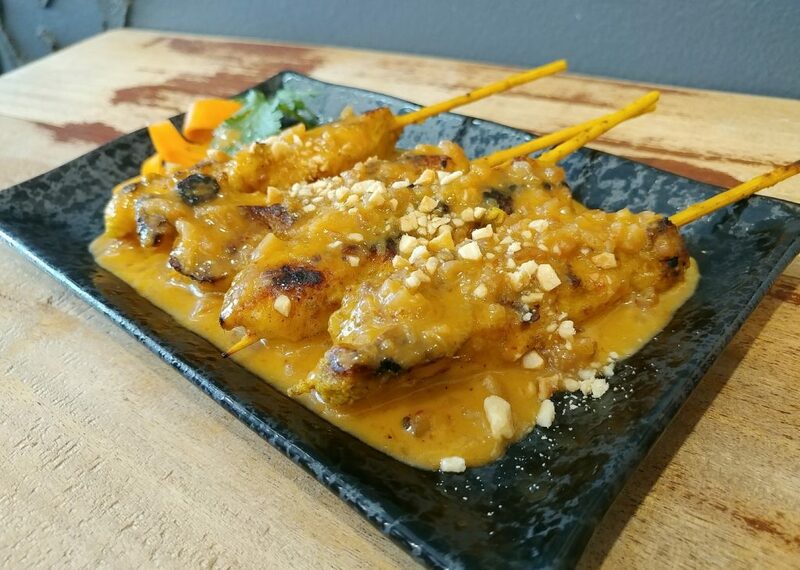 The Satay Skewers from another angle. 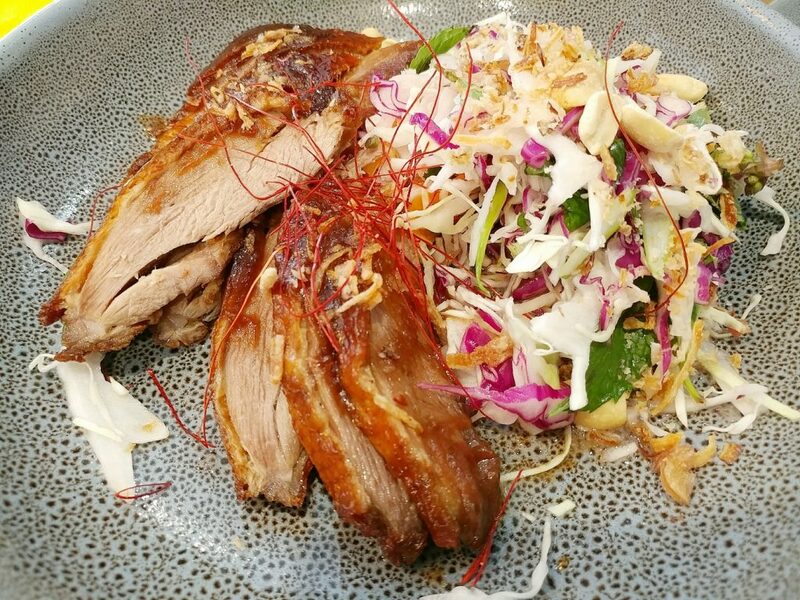 The Duck Tam was described in the menu as roasted duck with tamarind glaze and an asian salad. 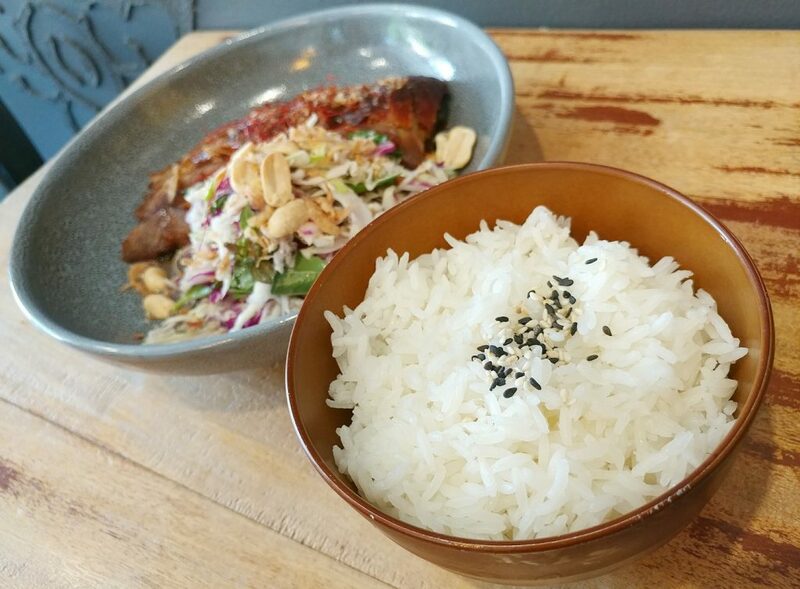 It came with a bowl of rice (this can be changed to coconut rice for an extra $2). 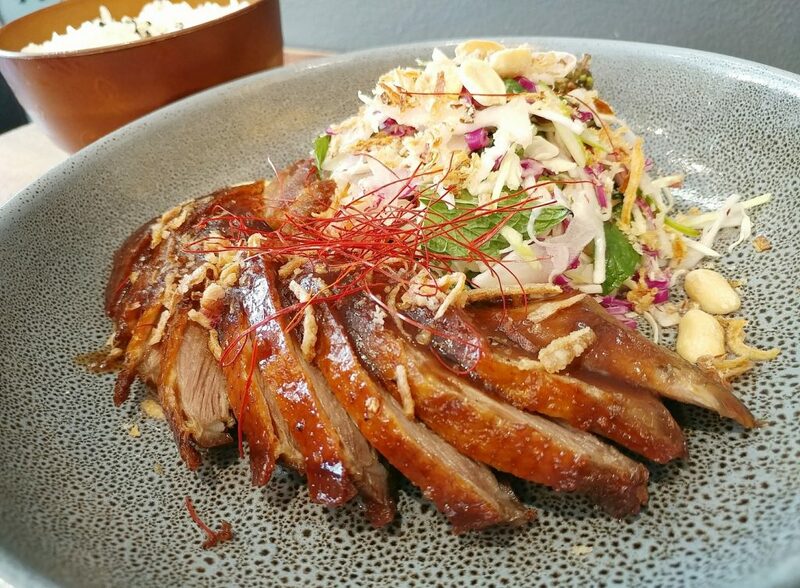 The dish was prettily presented, slices of duck fanned out around the salad like feathers on an extended wing. 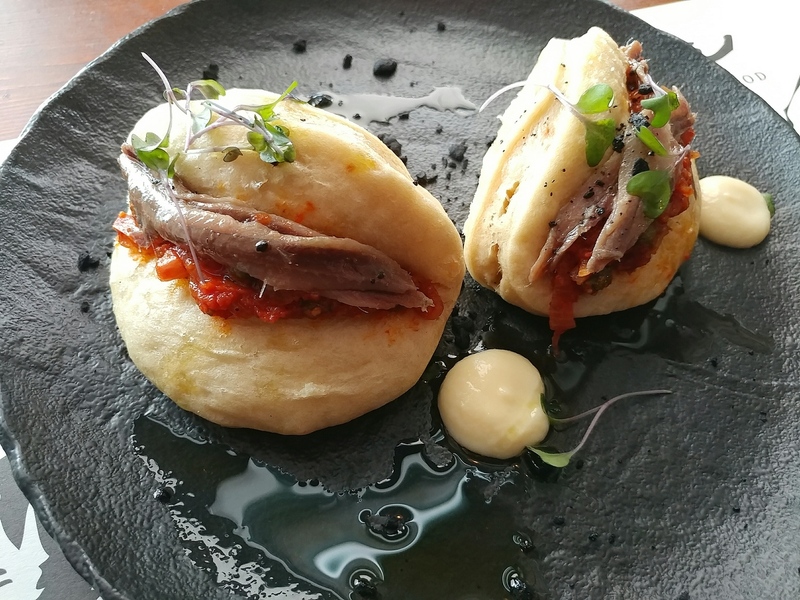 The meat was tender, and had the distinct creamy flavour of duck meat without being too gamey. The skin was savoury, a little sweet, and crispy in parts. The tamarind flavour was not overpoweringly tart. The salad with it was a light mix of shredded cabbages and cucumber, with mint and basil leaves in the mix, as well as halved and more finely chopped peanuts and fried garlic. 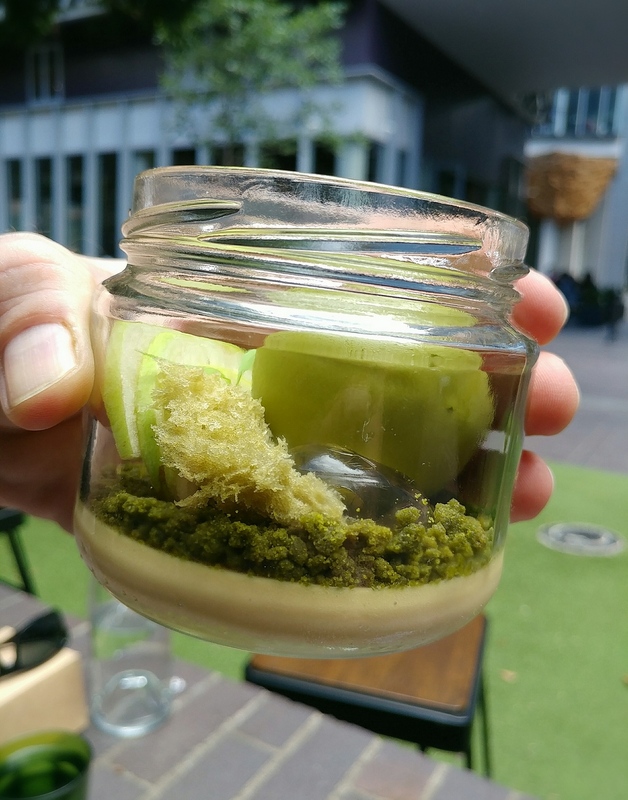 The dressing on the salad coated it enough that there was flavour from the dressing in each bite, but the salad wasn’t made soggy by it. The rice was fluffy and light, with separate grains. 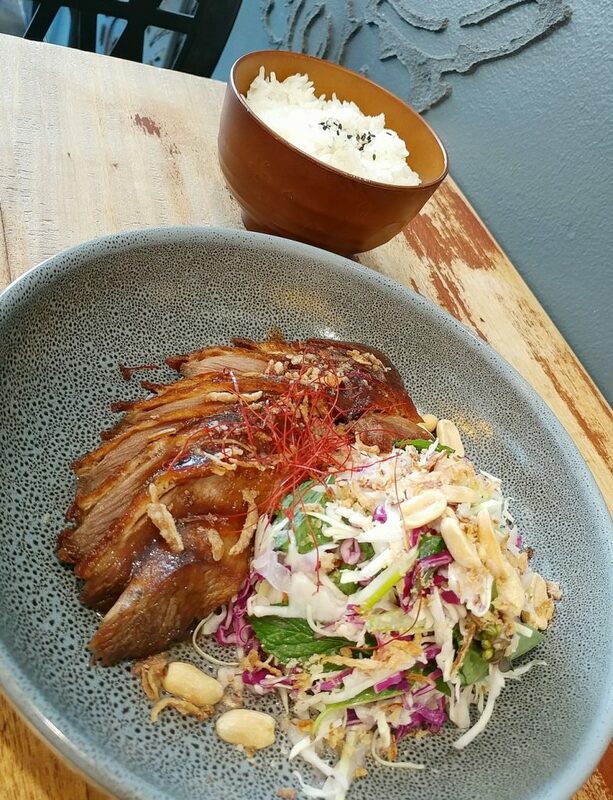 The Duck Tam, with asian salad, and rice. A closer look at the fan of duck meat. A look at the bowl of properly cooked rice. A look at how well the meat was cooked. 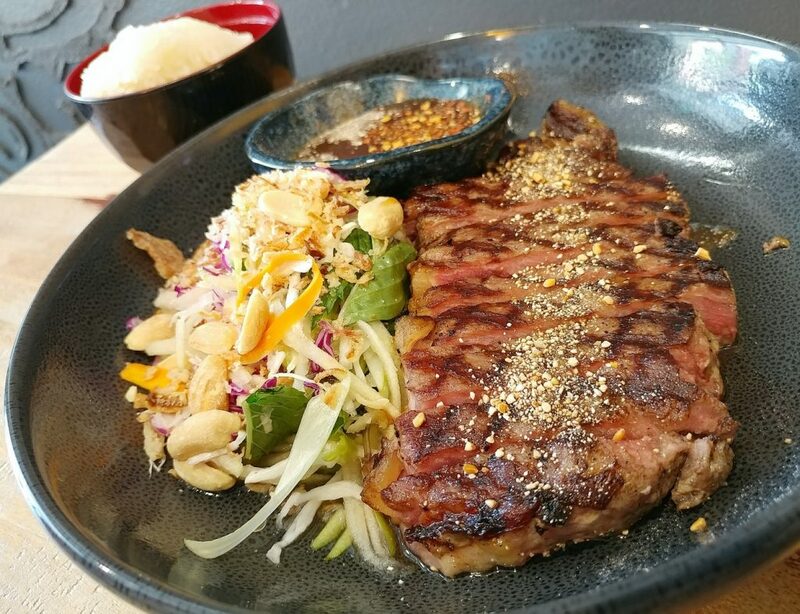 The E-Saan Steak with Sticky Rice was described in the menu as premium sirloin steak with a north-eastern style marinade, nam jim jaew, and green apple. 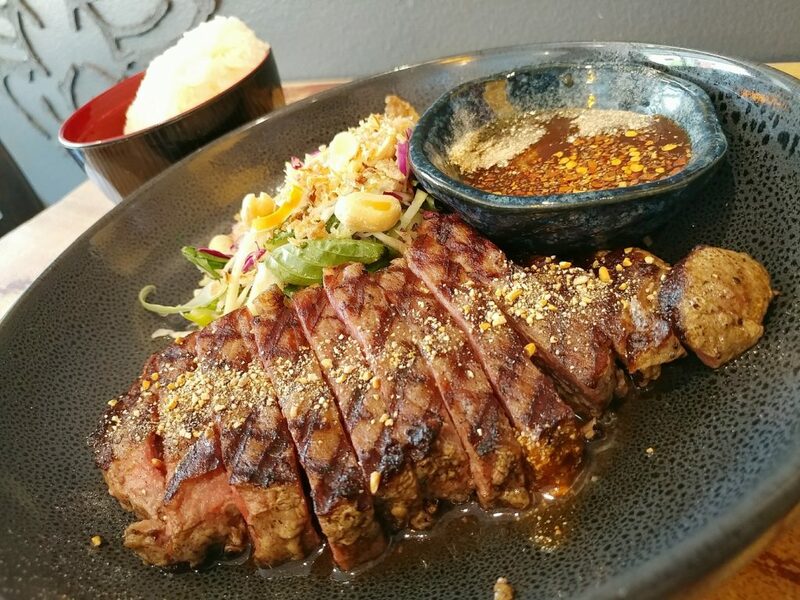 It, too, was nicely presented, with the steak thinly sliced, crushed peanuts sprinkled across the top not quite hiding the criss-crossing char marks from the grill, nestled next to the salad and small dish of dipping sauce. The steak was perfectly cooked, tender and still pink in the middle. It had a lovely char roasted flavour on the outside, and the marinade imparted a moreish savoury flavour to the meat that meant that it was tasty even without the dipping sauce. 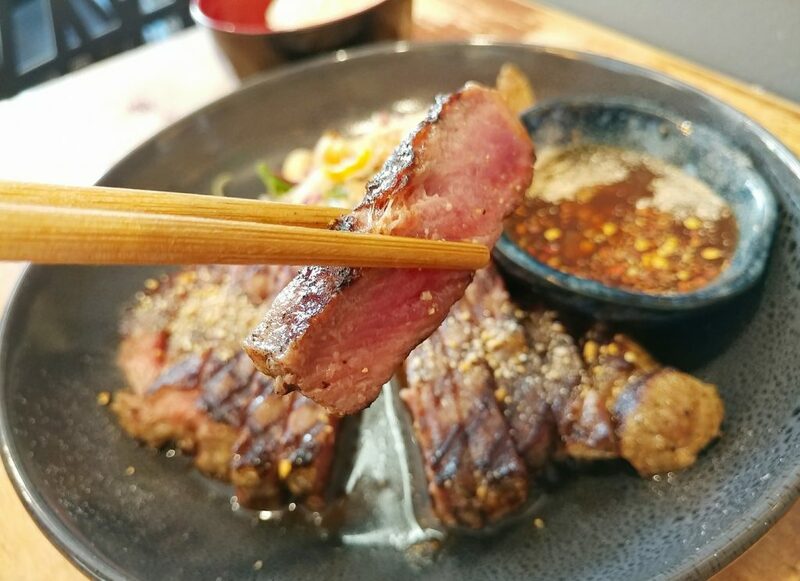 The thin slicing meant that you could eat the steak with just chopsticks, and while it retained texture, was easy to bite through. The dipping sauce was visibly a combination of many components before you mixed it together, with chilli flakes and a light brown powder that we thought was a mix of roasted rice and pepper scattered across the top. Together, it was sweet, sour, salty, fish saucy, and spicy, a potent combination of flavours. The sticky rice was indeed sticky and chewy. 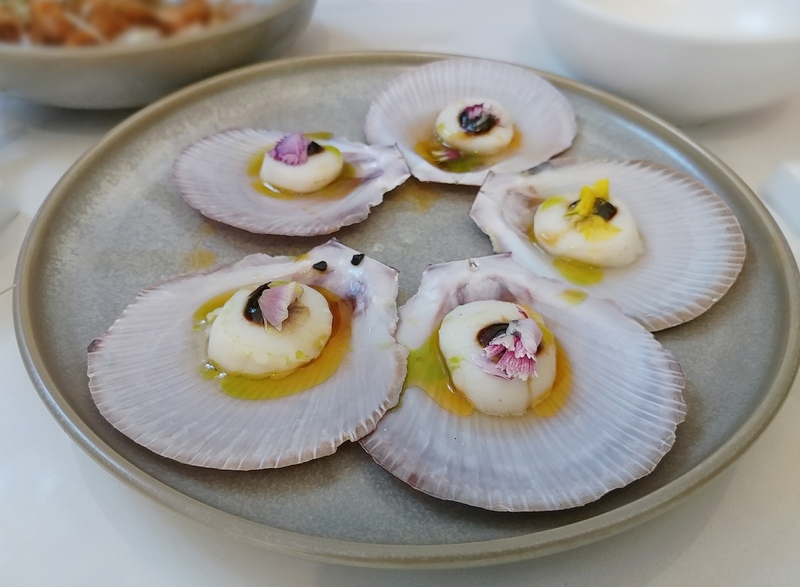 It was a different textural experience, compared to the usual white rice that one has with savoury dishes, as one usually encounters sticky rice in Thai dessert dishes. It worked well with just a slick of the thick, flavourful dipping sauce though. 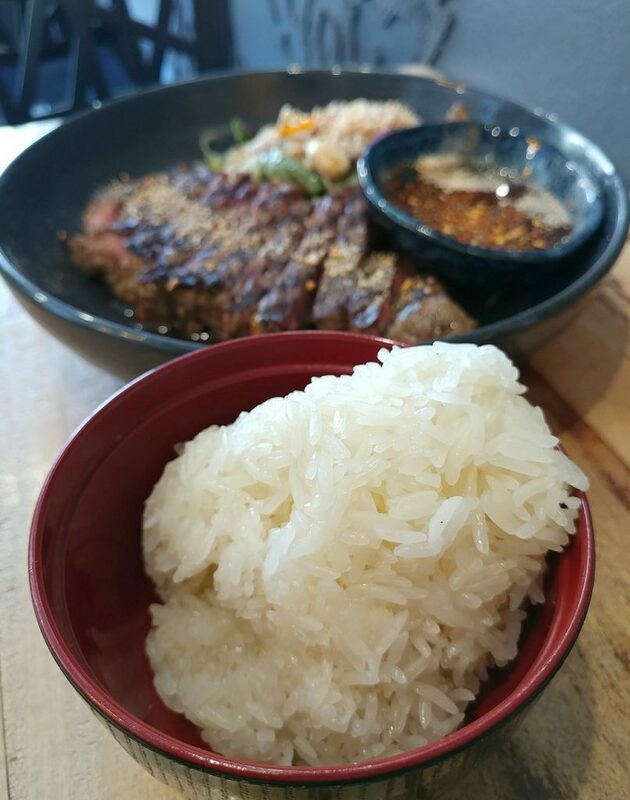 Our one bit of advice would be to have the sticky rice early on, as if you leave it too long, it does begin to harden on the outside. 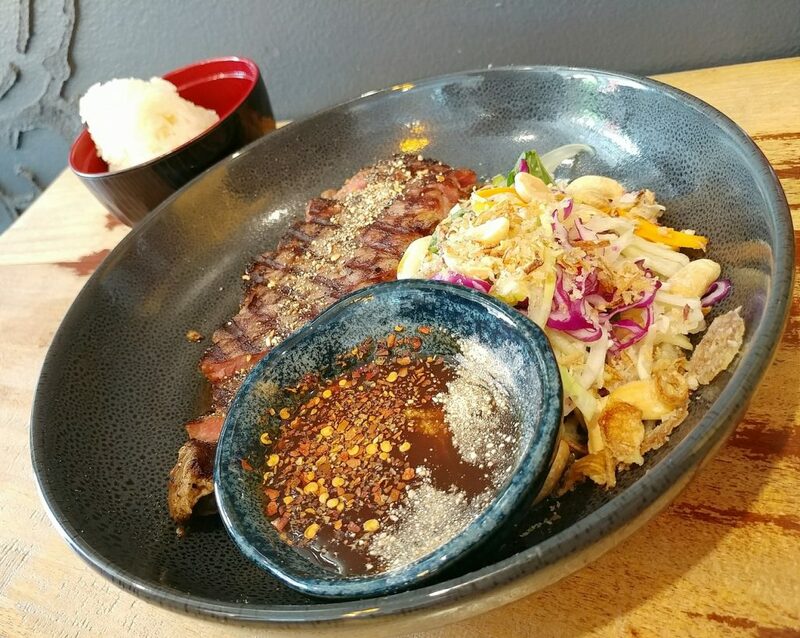 The E-Saan steak, with side of salad, and sticky rice. A look at the nam jim jaew sauce, with lots of components. A closer look at the steak, well cooked and sliced. The sticky rice that comes with the dish. Here’s how the meat was cooked. There was only one waitress serving all the tables when we were there, and at times it did get quite busy, with patrons at many tables, and other people walking in for takeaways. She managed the workflow well though, and seemed to look after everyone well. We found all the food we had at Gala Thai tasty. 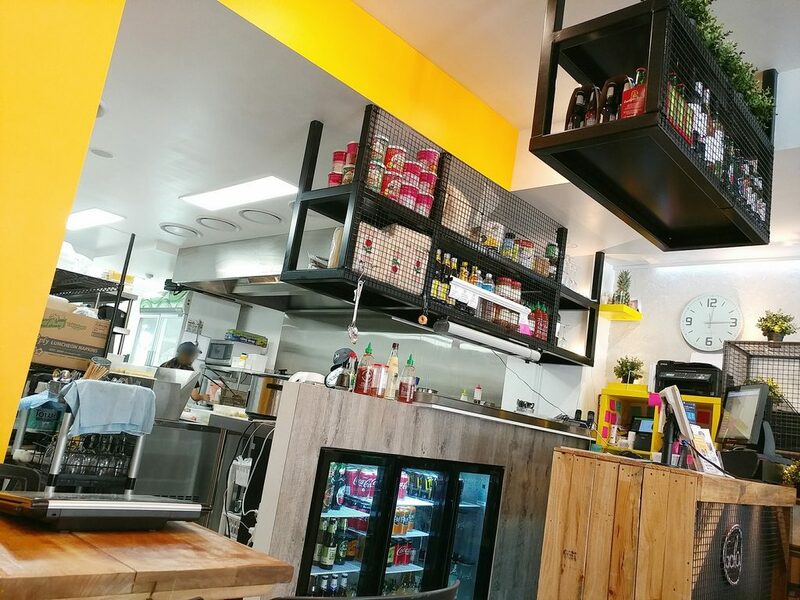 We learned from the owner that they aimed to serve up traditional Thai flavours, but with a modern presentation. They have certainly succeeded in that. This is well worth a visit. Price point: Entrees $8 to $10. Mains $16 to $22.